How to make a shuriken with your bicycle. Arrange for your chain to break during your morning commute. It is important to do this in the dead of winter when the temperature is about -22 Celsius. You can be assured of the best result if this happens when you are traversing a particularly dark section of wooded trail. Fumble about in the dark with your chain tool while your hands rapidly go numb. Peering through fogging glasses is helpful as well. Drop parts in the snow if you can arrange to do so. After you finally manage to reassemble your chain, pedal to work and continue about your day. This next part is very important. DO NOT INSPECT THE CHAIN TO VERIFY THAT YOU REASSEMBLED IT CORRECTLY. Instead, continue commuting on the bicycle for the next two weeks. When you start to experience horrendous chain slip is the time to inspect your bicycle. 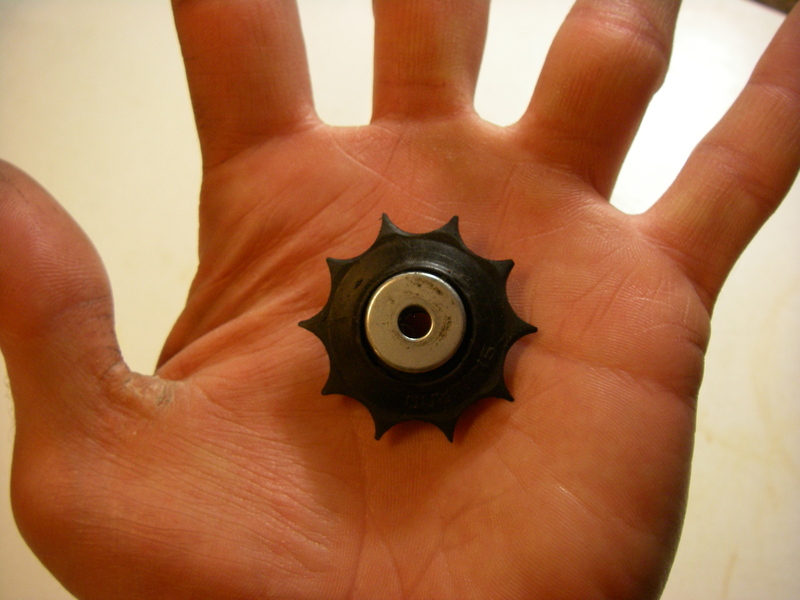 You will find that the teeth of your cassette or freewheel are badly worn out and you will have to obtain a replacement. You will now check the chain closely and discover that you lost a roller while assembling the chain in the freezing dark. This resulted in a link with an exposed pin that then did a very nice job of wrecking your drive train. The following Autumn when you are overhauling your bike for Winter service you will notice that one of the derailleur pulleys has been neatly transformed into a shuriken! Wasn’t that easy? It has been unusually late arriving, but the snow has finally started falling. Late Friday night, I was in the garage tuning up my Winter bike when I looked through the open door and saw gently falling snow. Obviously, I was meant to go for a bike ride. 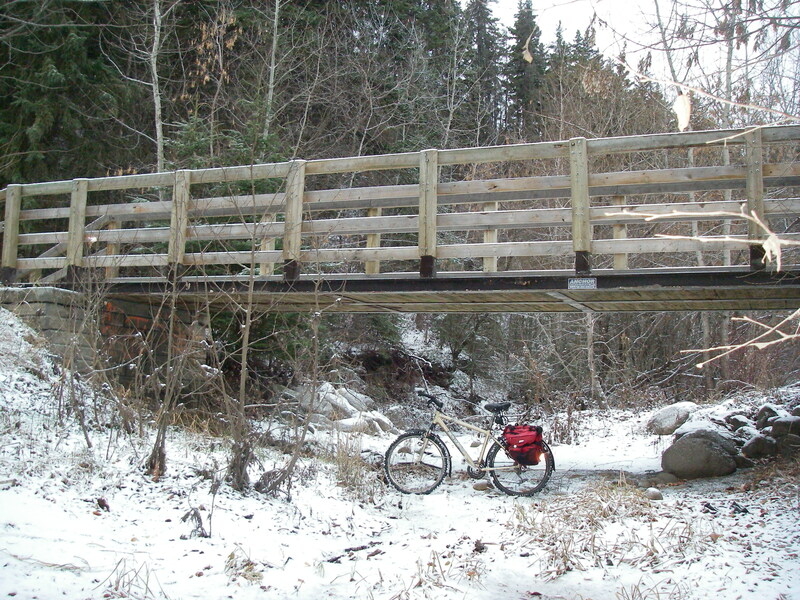 I headed out on empty streets for a quick descent down Kinnaird ravine to the river valley. The snowy night was gorgeous and the bike was handling beautifully. The shifters, brake levers and crankset I had recently put on were a great improvement. The new fenders were doing their job nicely. I had forgotten how smooth a ride the mountain bike has compared to my road bikes. 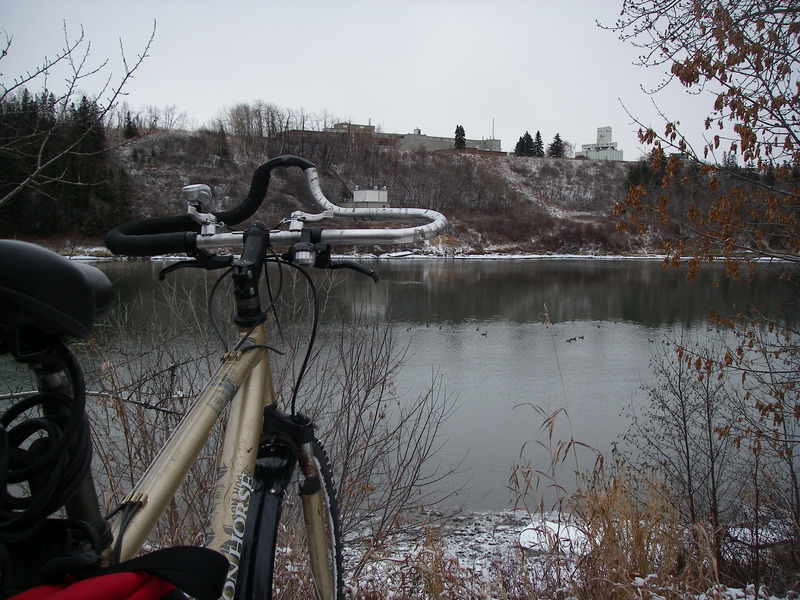 I rode through the valley for a while before heading up to cruise through the downtown core. The normally busy streets were pleasantly vacant at 2AM. After a stopping for a quick bite to eat I headed home. This first snowy ride was just excellent. I should have brought my camera. Today, I got up a little before dawn and went for another great ride. 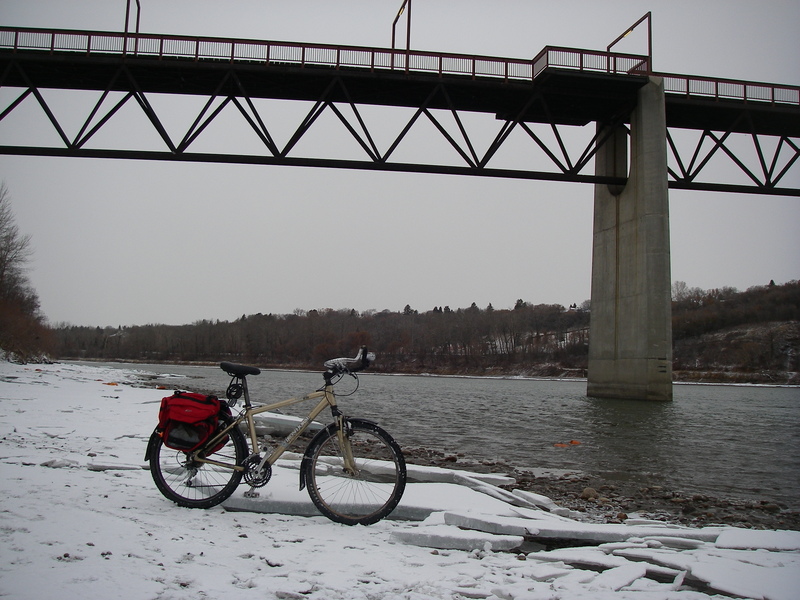 I plan on enjoying this early winter riding as much as possible as it is a little harder to maintain the positive outlook when the deep freeze arrives. I rode North and went down Kennedale ravine for some more river valley riding. The trails were deserted at the beginning of the ride, but were occupied by plenty of dog walkers toward the end. There were lots of ducks and geese in the river. The ducks seemed to be taking the weather philosophically, but the geese were making an awful racket. I imagine they were arguing about whose fault it was that they weren’t already someplace warmer. I headed back up Kinnard ravine and headed home. It was another excellent ride. This time I had my camera. Bike looks at geese. Yes, those tiny dots in the river.